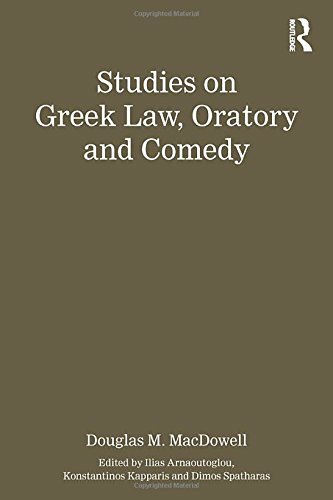 Douglas M. MacDowell (1931–2010) was a scholar of international renown and the articles included here cover a significant area of classical scholarship, discussing Athenian law, law-making and legal procedure, Old Comedy, comedy and law, politics and lexicography. All of these articles, published between 1959 and 2010, bear the characteristic marks of his scholarship: precision, balanced judgement, brevity and deep learning; they are rational and sober accounts of complicated and controversial issues. Many of these essays are virtually inaccessible as they were originally published in celebratory volumes or article collections which are now out of print or difficult to find outside major libraries. This collection of MacDowell’s articles will make these works available to a broad scholarly audience, and make it easier to bring this scholarship to the classroom as part of courses in Classics, ancient history, legal history and theatre studies. The volume includes a biography of MacDowell by Christopher Carey, based on the testimony of his closest colleagues and personal friends, which was presented to the British Academy.